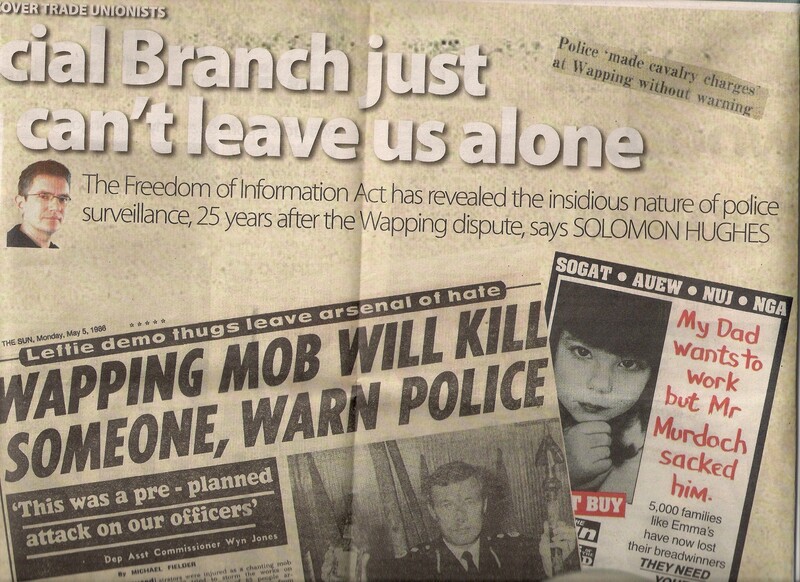 There was an interesting piece by Solomon Hughes in yesterday’s Morning Star about the surveillance of picket lines by Special Branch officers during the Wapping dispute 25 years ago. But it wasn’t so much the text of the article that caught my eye when I was handed a free, complimentary copy of the paper outside TUC Women’s Conference in Eastbourne yesterday morning, but the images that had been used to illustrate the article. Because I knew I’d seen those images somewhere before…. And now here’s a piece I wrote last year about the dispute – The beast at the gate. Scroll through it and check out the images/newspaper clippings I used to illustrate it. As you can see, I’m pretty rubbish at cutting in straight lines. 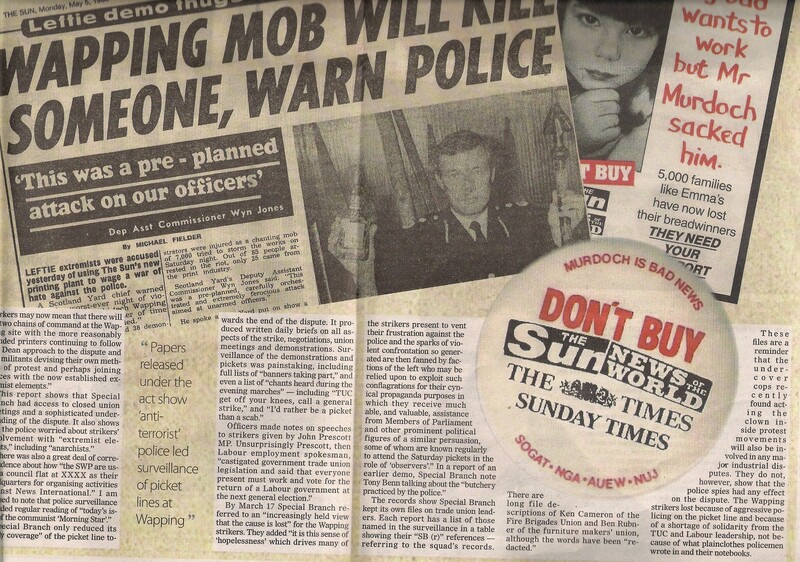 Now I’m not going to accuse the Morning Star of breach of copyright or anything, because to be honest I’m pretty sure I don’t have any kind of copyright over newspaper clippings, or over leaflets and badges that other people designed and produced. In fact truth be told, I wasn’t even sure when I wrote that post whether I was ‘allowed’ to even use those images myself, being as they weren’t my original work but simply ephemera I’d collected at the time and then scanned and uploaded to my computer. That is fairly rude. Out of curiousity I went to google images to see if it could just be coincidence, but no, it couldn’t. Pretty shoddy not to acknowledge you Cath. But, what an amazing “co-incidence” that they cut out the very same headline with the same cutting techniques! All is forgiven. I’ve just had an email from the Morning Star apologising for not crediting me for the images. Perhaps they have recognised you as ‘human’ Cath? Good result, in the end.